Energy efficient design and attention to detail combined with an elegant European aesthetic make Finnleo’s Traditional Saunas a classic choice. If you are looking for a easy to use and install option, be sure to consider the Passport and the Sisu Series. Choose from a variety of pre-fabricated sizes from 48”x48” to 144”x144” with endless lighting and entertainment options. If you are thinking about adding a sauna to your backyard design, consider a Metro Series or Patio Series Sauna, which come complete with completed roof kit and allow you to customize and select the exterior materials that work best for your project. You can even add a remote located control system, so you can turn on the sauna from indoors, and step into your own private oasis, tucked away in the privacy of your backyard. Look at the Designer Series if you desire a more modern design with customizable layouts and options. It’s hard to imagine that the modern, contemporary styling of Finnleo’s Designer Series Saunas are assembled from pre-fabricated panels. 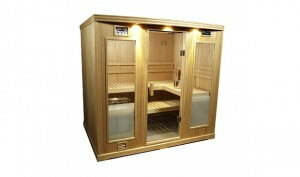 Choose from a variety of models and customize your sauna.